This is a highly equipped short delivery TOSHULIN EXPERTURN 1600-3! The high performance EXPERTURN 1600-3 has a large 79" Swing and Turning capacity. The EXPERTURN features Heavy Duty Box Ways, 6 position cross rail with M code programming, a floor level foundation for clean and easy installation and a full guarding with easy operator access. This machine has the optional larger 12.59" x 12.58" Ram for efficient and rugged machining. 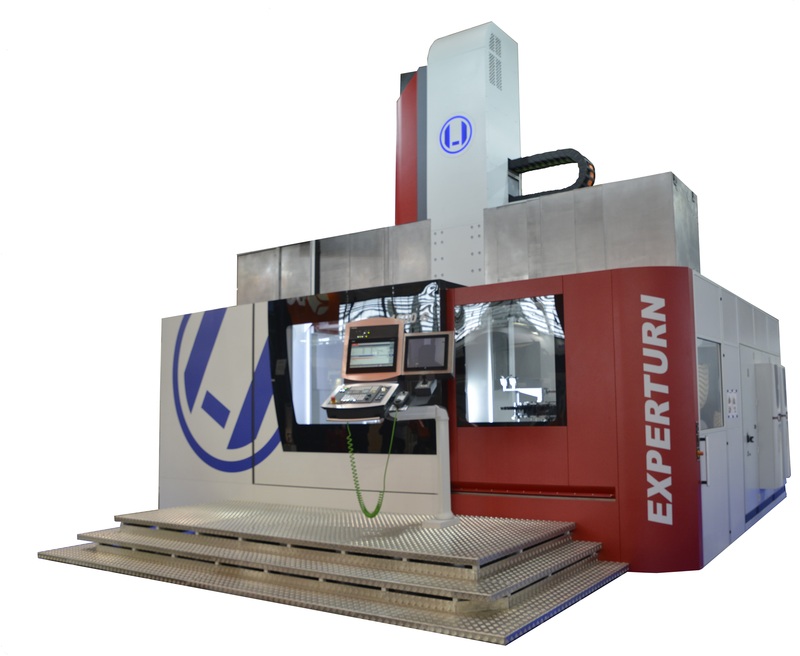 In addition, this EXPERTURN 1600-3 features a fully programmable C-axis table and fully programmable C-axis head which provides Y-axis capable milling, drilling and tapping off center with the 38 HP 4,500 rpm live spindle. This machine also includes both vertical and horizontal milling adapters with built in 8,000 rpm spindles. Call 513-271-3380 for more details! This is a high performance POWERTURN 2000-3! The high performance POWERTURN 2000-3 has a large 98" Swing and Turning capacity with extended crossrail height providing a maximum part height of 102". The POWERTURN 2000 features Heavy Duty Box Ways, 18 position cross rail with M code programming, a floor level foundation for clean and easy installation and a full guarding with easy operator access. In addition, this POWERTURN 2000-3 features a fully programmable C-axis head which provides Y-axis capable milling, drilling and tapping off center with the HSK 63 A 8,000 rpm Kessler live spindle. This machine also includes both vertical and horizontal CAPTO C6 turning adapters and a vertical 4,000 rpm HSK 63 A live spindle adaptor. Call 513-271-3380 for more details! This is a short delivery TOS KURIM FRP Table Type Portal Machine! The high performance FRP 250 Gantry has a large distance between columns and a tall height clearance. This FRP 250 is equipped with a 98", 144 HP turning table, with guarding around the cutting area, with easy operator access. The FRP 250 ram is a 19.6" x 19.6" square featuring a 50 HP milling spindle drive. 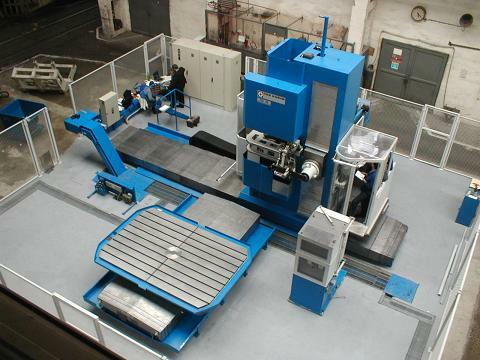 This machine comes with a 5 axis, angle head, straight head and turning head, with automatic head and tool changing for efficient and rugged machining for any large milling or turning part machining requirement. Call 513-271-3380 for more details! This is a short delivery TOS KURIM FCU 160 B Travel Column Floor-Type Boring Mill! 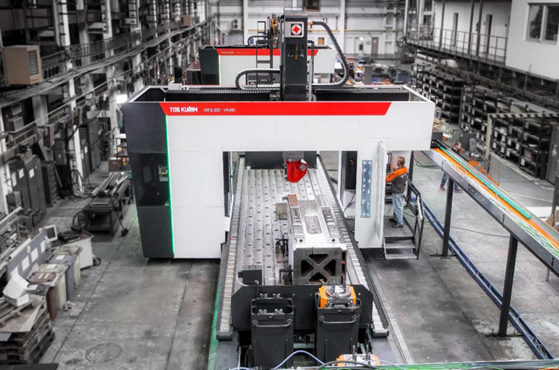 The TOS KURIM FCU 160 Traveling Column Floor-Type machines utilize 100% Hydrostatic way systems for heavy-duty, high horsepower and high torque cutting along with high feed and rapid rates over the full volume of the very large work cube. The FCU 160 can be designed and delivered with a variety of attachment heads to solve the most demanding large heavy part production environment. This FCU 160 B features X travels of 314" (8,000 mm), Y-axis of 137" (3,500 mm) and a 25.2" x 25.2" (640 x 640 mm) square ram with a Z-axis (Ram Travel) of 63" (1,600 mm) and 6.3" (160 mm) 95 horsepower diameter bar. 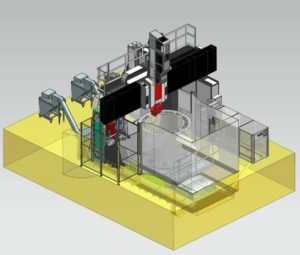 This machine also features a 40-position tool magazine, high pressure coolant system, and a TOS KURIM VO B five-sided head and a VR2 right angle head. We can add a variety of new tables and floor plates to this machine to suit most any production requirement. Call 513-271-3380 for more details! This is a short delivery TOS KURIM FRF Bed Type Gantry! The high performance FRF 300 Gantry has a large distance between columns and a tall height clearance. This FRF has a cfloor level foundation for clean and easy installation, with guarding around the cutting area, with easy operator access. The FRF 300 ram is a 19.6" x 19.6" square featuring a 50 HP spindle drive. Many optional heads can also be provided with automatic head changing for efficient and rugged machining for any large part machining requirement. Call 513-271-3380 for more details! The high performance FRF 250 Gantry has a large distance between columns and a tall height clearance. This FRF 250 has floor level foundation for clean and easy installation, with guarding around the cutting area, with easy operator access. The FRF 250 ram is a 19.6" x 19.6" square featuring a 50 HP spindle drive. Many optional heads can also be provided with automatic head changing for efficient and rugged machining for any large part machining requirement. Call 513-271-3380 for more details! This is a short delivery TOSHULIN BASICTURN 1250-2! The high performance BASICTURN 1250-2 has a large 55" Swing and Turning capacity. The BASICTURN features Heavy Duty Box Ways, 6 position cross rail with M code programming, a floor level foundation for clean and easy installation, and a full tall guarding with easy operator access. The RAM is 7.87" x 9.44" and 100 HP table drive provide efficient and rugged machining for any large turning requirement. Call 513-271-3380 for more details! This is a short delivery TOSHULIN BASICTURN 1600-2! The high performance BASICTURN 1600-2 has a large 78" Swing and Turning capacity. The BASICTURN features Heavy Duty Box Ways, 6 position cross rail with M code programming, a floor level foundation for clean and easy installation, and a full tall guarding with easy operator access. The RAM is 7.87" x 9.44" and 100 HP table drive provide efficient and rugged machining for any large turning requirement. Call 513-271-3380 for more details! 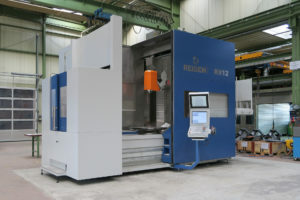 This is a Factory DEMO stock delivery REIDEN RX 12 with turning! The high performance RX 12 is designed to minimize all moving parts, guaranteeing premium stability and superior accuracy. This RX 12 features the REIDEN turning option for true mill turn capabilities on the same machine. 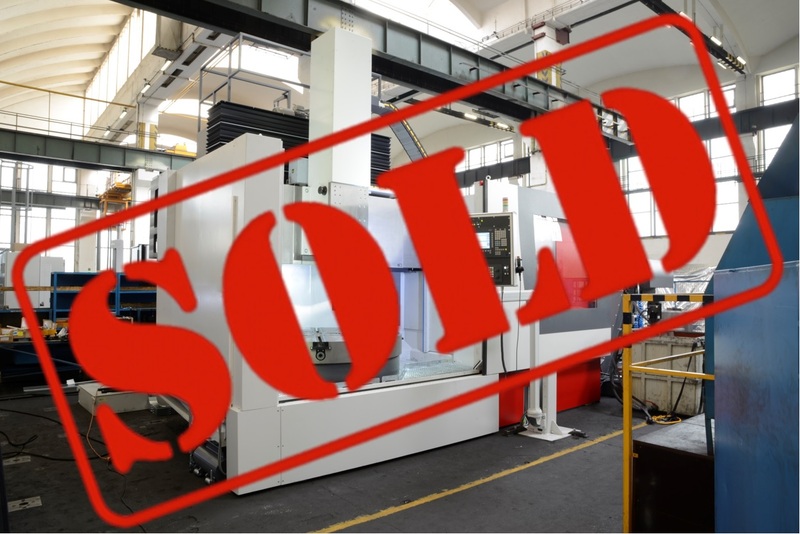 The RX 12 is a compact 5-axis universal machining center with a very small footprint. 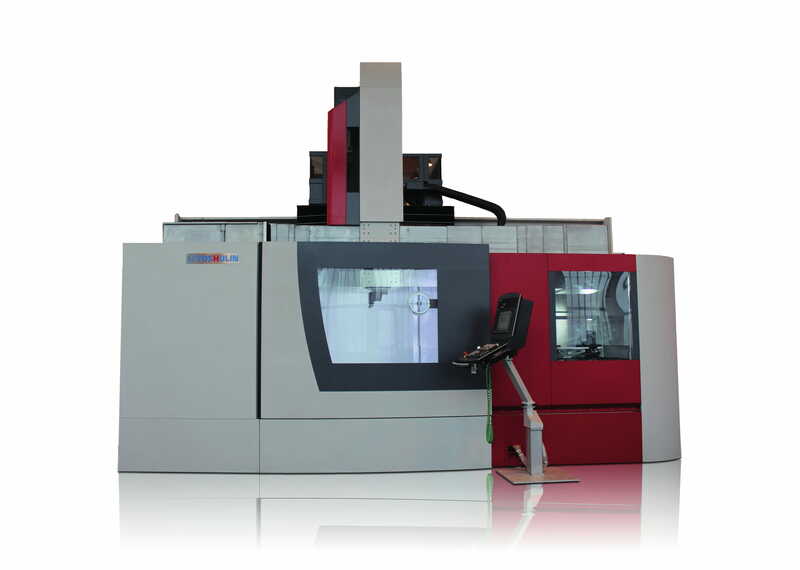 Despite its compact design, the machine offers a significant machining envelope in relation to its dimensions. Call 513-271-3380 for more details!